Find out about the History of Solana Beach, a listing of local schools, the location of our Farmer's Market, information about city projects, municipal codes, and the Department of Parks and Recreation schedule, electronic and hazardous waste collection, and much more. Search all 32 branches for that certain book you have been wanting to read and it will be held at the Solana Beach branch for you to pick up. You can also look online to see when the book has arrived, review the due dates of any books you have checked out and see if you have any fines due. Sign up for on-line bill payment, discover whether there is flouride in our water, and learn about available school programs and scholarships. Learn about DVR, Parental Controls, HDTV and more. View payment options, learn about energy efficiency, schedule a free inspection of all your gas appliances, learn how to prepare your home for winter, and much more. Pay your bill, schedule a bulky item pickup, find out what constitutes Green Waste or Hazardous Waste, and request additional carts. 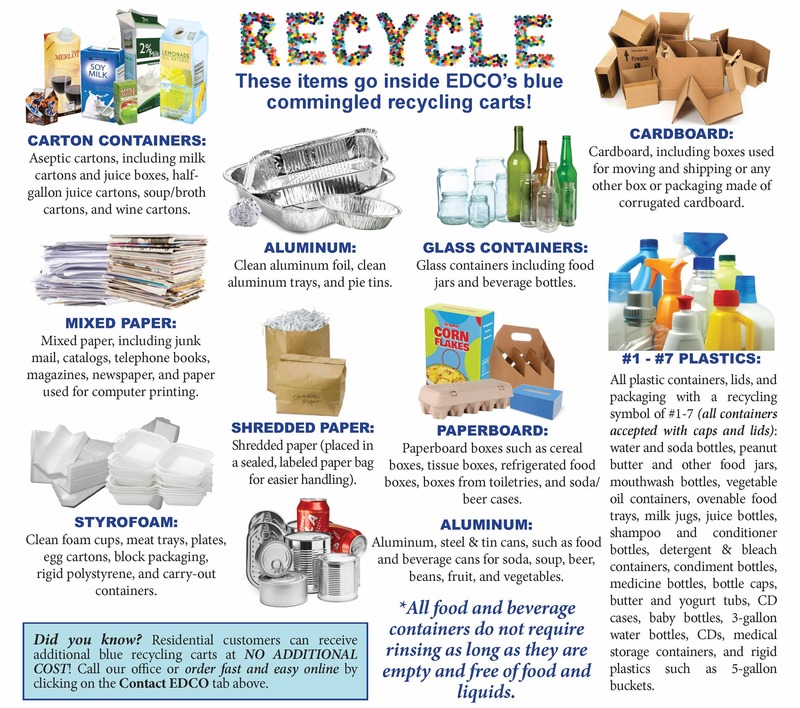 Here is a flyer that describes the items that are allowed to be recycled: EDCO Recycling Items. Learn about Megan's Law, look up a restraining order, or request a copy of a parking citation. You can also request a report about crimes, arrests, and accident information. Find out about pet adoption, vaccinations, licensing, and lost and found. For dead animal removal in SD County call D&D's 24 hour phone: (888)299-9905.